by John Watkins Brett, Esq. M.R.I. Introduction: The brothers Brett proposed in 1845 to establish a general system of telegraphic communication for Britain, and in 1847 obtained a concession from the French Government to establish a cable between England and France. The Bretts’ Channel cable of 1850 quickly failed, but a second attempt between Dover and Calais in 1851 proved a lasting success: the world’s first commercially viable submarine telegraph cable. 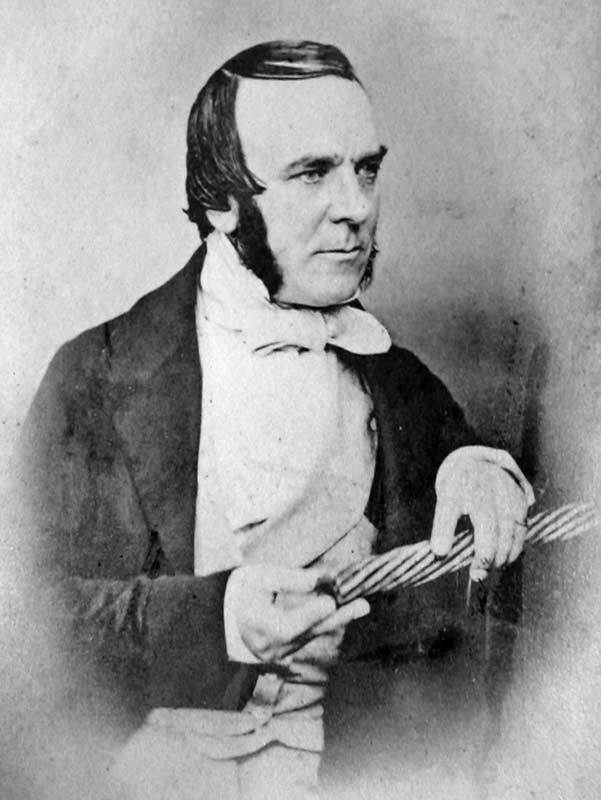 This 1857 presentation by John Watkins Brett to the Royal Institution gives a brief history of the brothers’ involvement in the early cable enterprise. Thanks to Steven Roberts for providing the transcription of the article. The photographs of the Bretts are from other sources. His Grace The Duke Of Northumberland, K.G., F.R.S. * H.R.H. The Prince of Wales was present. John Watkins Brett, Esq. M.R.I. I purpose this evening to give you a brief sketch of the part I have taken in the promotion of submarine telegraphs, and shall strictly confine myself to a narrative of tins enterprise, and some of the difficulties I have had to encounter at different stages of their progress. It has been stated by some that I had sought, or attempted to appropriate to myself, the honour of the invention, of the submarine telegraph. I will here state, that my first idea of submarine telegraphs arose out of a conversation with my brother early in 1845, when discussing the system of electric telegraphs, as then recently established between London and Slough; and, in considering the practicability of an entire underground communication, the question arose between us, “If possible underground, why not under water?” and “If under water, why not along the bed of the ocean?” The possibility of a submarine telegraph then seized upon my mind with a positive conviction; and I was ignorant until three or four years since that a line across the Channel had been previously projected by that talented philosopher, Professor Wheatstone,* (who, it will be remembered, with Mr. Cooke, first introduced the electric telegraph into this country,) and also of the experiments by frictional electricity during the last century, to send a current across rivers. * The original plans of Professor Wheatstone’s project of a Submarine Electric Telegraph between Dover and Calais, drawn in 1840, were exhibited in the Library. It is now nearly twelve years since (June 1845) my brother and I entered, in our joint names, at the Government Registration Office, a project for uniting America with Europe, by the very route now adopted; and in July of the same year submitted to the Government a proposition for uniting our Colonies with Great Britain, offering to Sir Geo. Cockburn, First Lord of the Admiralty, (to whom I had been referred by Sir Robert Peel,) as a first experiment to place Dublin Castle in instantaneous communication with Downing Street, provided £20,000 was advanced by the State towards the expense. 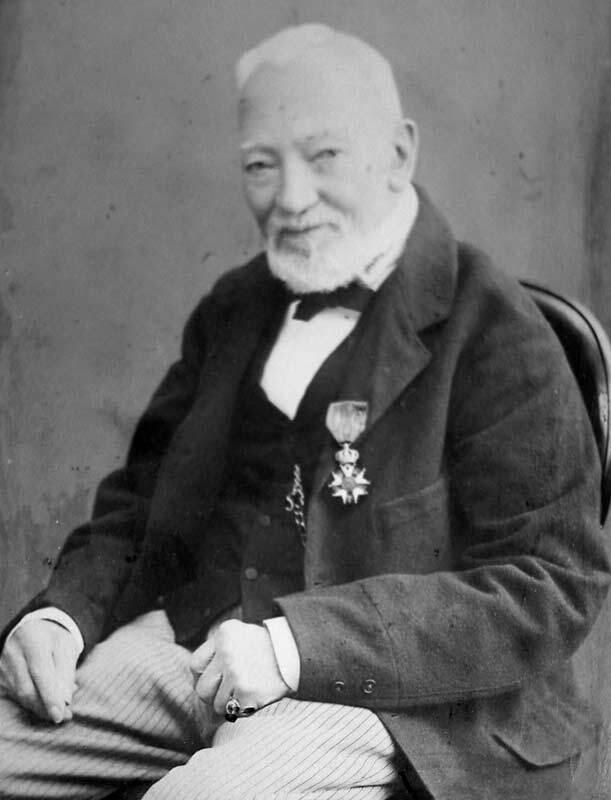 This offer not being accepted, I turned my attention to the Continent, which I visited, and spent large sums of money in endeavouring to promote the electric telegraph in France, Prussia, and other Continental States. In 1847, I succeeded in obtaining permission from Louis Philippe to unite England with France by a submarine line, but failed to obtain the attention of the public, it being considered too hazardous for their support. When the course of events placed Louis Napoleon at the head of the French nation, I brought the subject under his notice, soliciting such protection as I thought would induce the public to support the undertaking, and received an encouraging reply; nevertheless, £2000 only was subscribed for the first experiment. The first attempt to connect England and France by a submarine telegraph was made in 1850, with a copper wire inclosed in gutta-percha, a material which opportunely came to our aid about that time. About 27 miles of this wire were conveyed on board the Goliath steam-tug, and wound round a large iron cylinder or drum to facilitate the paying it out, and the vessel started from Dover, exciting little or no curiosity at the time. The end of the wire attached to land was carried into a horse-box at the South-Eastern Railway Terminus, and we commenced paying out the wire, pieces of lead being fastened to it at intervals to facilitate the sinking. Electric communication from the vessel to the shore being kept up hourly, during its progress, the only drawback was a fear lest this frail experimental thread should snap, and involve the undertaking in ridicule. The trial was, however, successful; and the Times of the day justly remarked, “the jest of yesterday has become the fact of to-day." The place chosen on the French coast for landing the wire was Cape Grinez, under a cliff among rocks; being purposely selected, because it afforded no anchorage to vessels, and was difficult of approach. My station at the Dover Railway afforded an elevated position, from whence, by the aid of a glass, I was able to distinguish the light-house and cliff at Cape Grinez. A declining sun enabled me to discern the moving shadow of the steamer’s smoke on the white cliffs, thus indicating her progress. At length the shadow ceased to move. The vessel had evidently come to an anchor. We gave them half an hour to convey the end of the wire to shore, and attach the printing instrument; and then I sent the first electric message across the Channel—this was reserved for Louis Napoleon. I was afterwards informed that some French soldiers who saw the slip of printed paper running from the little telegraph instrument, bearing a message from England, enquired, “how it could possibly have crossed the Channel ?” and when it was explained that it was the electricity which passed along the wire, and performed the printing operation, they were still incredulous. After several other communications, the words “All well,” and “Good night,” were printed,* and closed the evening. * These communications were printed in Roman type. In attempting to resume communication early next morning, no response could be obtained; and it soon became evident that the insulation was destroyed, either by a leakage of the electric current, or by its having snapped asunder. It was conjectured, by the indications of the galvanometer, that it had parted near the French coast, which fact was ascertained on the return of our steamer, when we fished up the end. Knowing the incredulity expressed as to the success of the enterprise, and that it was important to establish the fact that telegraphic communication had taken place, I that night sent a trustworthy person to Cape Grinez, to procure the attestation of all who had witnessed the receipt of the messages there; and the document was signed by some ten persons, including an engineer of the French Government, who was present to watch the proceedings; this was forwarded to the Emperor of the French, and a year of grace for another trial was granted. Thus encouraged, and aided by the support of friends, including the late Lord De Mauley, who ever rendered the most willing cooperation to the enterprise, a more permanent cable was submerged in September 1851, between the South Foreland and Sangate on the French coast; and the line of telegraphic communication between England and France, now exerting so great an influence on the interests of those countries, was established. In May 1853, the Dover and Ostend line was laid down. This commenced at the South Foreland, and terminated at Middle Kirk, about five miles from Ostend. Its length was about 70 miles. Captain Washington, R.N., and Captain Smithett, rendered important service to this operation by directing our route. Up to this time the depths encountered had been, comparatively speaking, trifling, the British Channel nowhere exceeding thirty fathoms. My next trial was in the unknown depths of the Mediterranean. The same year concessions were granted to me by the French and Sardinian Governments, to unite the Islands of Corsica, Sardinia, and the colony of Algeria, with their respective capitals. The cables were manufactured at Greenwich, and sent out in the steamer Persian, in July 1854. On arriving at Genoa, I found that the Sardinian government had placed three vessels of war at my disposal; and we set sail at ten at night, for the harbour of Spezzia, the place selected for making fast the cable; H.R.H. Prince Cariginan, several ministers, and the Ambassadors of England and France, accompanying us. The spot I had chosen, by accident, was a cliff under a building once occupied by the immortal Dante, and wherein he composed a portion of the Inferno. Here the end of the cable was attached amid a salute of 60 guns, a scene in striking contrast to our solitary proceedings at Dover, when the first cord that ever carried instantaneous intelligence from Continent to Continent was submerged. Captain Marquis Eicci, a Sardinian naval officer of reputed skill, was on board, and advised us not to venture across the Mediterranean in a direct line, where we should have to encounter unknown soundings, but to make a curve of some miles by the Islands of Gorgonia and Capraia, where the depth would be little more than 100 fathoms. I replied, as greater depths- would have to be encountered between Sardinia and Africa, it was better at once to prove the risk; and, accordingly, we proceeded in a direct line, accompanied by the frigate Malfatano, commanded by the Marquis Boyle, who rendered us valuable service, by directing our route, and by taking soundings as we progressed. The cable was laid in coils in the hold of the vessel, and before paying out was passed four or five times round two large iron drums, running out over an iron saddle on the stern of the vessel to the water, the pressure at this point in deep water being very great. For 14 miles all went on steadily: the pressure now caused some of the wires of the outer covering to break from tension, and on entering the great depths, one of those sudden flights of the cable occurred, which has taken place once on each subsequent occasion between Sardinia and Africa; every means were employed to stop it, and after a few minutes its progress was arrested, and it was brought up by a dead stop, when it was found that the insulation was destroyed in a portion that had passed into the sea, during this violent flight. Our only chance now was to recover from the sea the injured portion, cut it out, and make a fresh join,—a difficult and tedious operation, which occupied upwards of 30 hours, the strain upon the cable being excessive, in consequence of the great depth, 230 fathoms. When the injured portion came up, it was found that the violent twist of the outer wire had cut into the gutta percha wire of the inner core, and exposed it to the fatal action of the water, which carried off the current. Having repaired the injury, an electric current was sent to Spezzia; and the soundness of the six conducting wires to land proving correct, we proceeded. On nearing the coast of Corsica in the evening a fire and flag on shore indicated the spot where the cable was to be made fast. The vessel anchored about a mile from the coast, and the remaining portion of the cable was conveyed ashore in boats. This done, an electric communication was instantly dispatched through the cable to Paris and Turin, announcing to the French and Sardinian Governments the telegraphic union of Corsica with France and Piedmont. We then sailed for the Straits of Bonifaccio, and the submerging of the submarine cable between Corsica and Sardinia was successfully accomplished a few days afterwards; also the completion of the land lines, in the aggregate about 500 miles in length, through the two islands, uniting the different towns. The possibility of establishing a line of telegraph through these wild and lawless districts had previously been questioned, a guard of horse being thought necessary to protect it from injury : but the result proved that the public in all parts of the world may be trusted; and it is remarkable that only one instance of wilful injury has ever occurred throughout these islands; and the line has been in daily use since April 1855, and the French and Sardinian Governments have forwarded several thousand messages annually through it. The submarine cable for connecting Sardinia with Algeria was made the same year. It was 150 miles in length, and weighed 1200 tons, and, allowing for coals, required a steamer of 2000 tons to carry it. Being unable to procure a steamer of that size in this country, in consequence of the war with Russia, I applied to the Emperor of the French for one, and at the same time expressed a wish that the portion of the Mediterranean I was about to cross should be sounded. I was directed to call upon the Minister of Marine, the Emperor adding that he would speak to him on the subject. On seeing the Minister, however, and naming the size of the steamer required, I was informed that the Government had not a vessel of this size at their disposal. But the soundings were made, and the result proved depths of 3000 metres, or nearly two miles, being from fifty to sixty times the depth of the English Channel. The impossibility of obtaining a vessel of the required size continuing, and my friends becoming impatient of delay, I engaged, the following year, the Result, a large sailing vessel, and two of the best steamers I could procure to tow her, and operations were commenced from Cagliari, in September 1855. We encountered, on entering the great depths, one of those alarming flights of the cable which occurred in the previous year. In this instance about two miles, weighing sixteen tons, flew out with the greatest violence in four or five minutes, flying round even when the drums were brought to a dead stop, creating the utmost alarm for the safety of the men in the hold, and for the vessel. It was brought up by its encircling a large timber in the hold. Our means on board proved ineffectual to raise it, and the capstan broke by its weight, and rough weather coming on the vessel became unmanageable, and lost her course; there was therefore no alternative but to sever it from the injured portion in the sea, and it being evident that a sailing vessel would not do, I resolved to cut the cable and save the eighty-six miles for another attempt. I had another and longer cable manufactured for the ensuing year, and finding opinions strong against taking the deeper direct line, it was resolved to carry it east of Galita, making a detour round the island, and thence to La Calle on the African coast. We started from Cape Spartivento on the 6th of August, 1856, and all went on most favourably for about 60 miles, our speed being 2 ½ nautical miles an hour, a considerable velocity for a cable, which, be it understood, has to be handed up by men below decks. At the repeated wish of the French authorities on board, who had been appointed by the French Government to direct our course, it was decided that our steamer should be towed; this I believe to have been a mistake, though, not being a sailor, I am perhaps not qualified to give an opinion upon the subject. My attention on board was chiefly directed to the arrangement of the machinery, and the speed of paying out the cable, and regulating its progress by the log, a duty requiring unremitting attention. When we had successfully accomplished this 60 miles, one of those sudden and alarming flights of the cable occurred, similar to the one which had happened once in each former year. Fortunately it was arrested without difficulty in less than three or four minutes, but it was discovered that, in arresting it, the insulation of a portion which had run out some miles in the sea had been injured. The manner I proposed to the French commander to recover the injured portion of the cable was to sever it, and attach the sound end on board to his steamer, and by his endeavouring to maintain a fixed position while we steamed under it at half power until we came to the injured part, to repair it; but this was abandoned, as he was of opinion that his vessel, being of less power than ours, would only be dragged after us. I determined therefore to sever the cable, return to Sardinia, and raise it from that end. We proceeded to the island accordingly, and when near the shore fished up the cable, which was clearly discernible in the blue waters at a depth of ten fathoms, severed it, and passed one end fore and the other aft, giving each of them a turn round the drums, and then joined them over the deck of the vessel, and erected another wheel at the bows. This done, we steered forward under the cable, raising it from the depths forward and letting it back over the stern. This plan answered perfectly, and we recovered 18 miles from the sea, which it was calculated, with the 126 miles* on board, would be more than enough to reach Galita. When these 18 miles had been recovered, they were spliced on to the coil on board, then passed five times round each drum; and we lay to for the night. On the morrow, at the suggestion of the French authorities, it was arranged that the speed should never be less than three nautical miles per hour; and this speed never was slackened, even when the log gave an increase to nearly 4 miles, during the whole time of the paying out of the 126 miles of cables, except on one occasion when the drums caught fire for a few minutes. With this exception it was all payed out with the most perfect success. I placed three tried and brave men at the breaks, and had the t result of the log placed before them every quarter of an hour, timing the revolution of delivery of the cable over the drums by a minute watch. These experienced hands nobly did their duty, and we never left our post by day or night. It was an anxious moment when at nightfall we were about to enter depths of 1600 fathoms, which exceeded by four times those thought to be practicable;* we had also during this part of the operation to change the continuation of the cable from the fore hold to that of the midships, or upper hold, and also to remove the mid deck, to enable the coil to come up from the lower deck, operations involving labour and great risk; yet we dared not stop, being warned that a perpendicular strain on the cable in great depths would be fatal. * Four hundred fathoms having been said, by experienced engineers, to be the greatest depth practicable. In the morning Galita appeared in sight; onward we went, but did not appear to near it; an observation of the sun at the meridian proved that we were out of our course. We signalled to the commander of the French towing vessel, and gave our observation, which proved to be correct. The French commander attributed the deviation from his course to the currents, which he stated in his report took him 20 miles out of his course. The distance to land now, according to our reckoning, was 12 or 13 nautical miles, whereas the length of telegraph cable remaining on board was only 12 statute miles. A consultation was therefore held with the French commander; and it was determined, that as it was impossible to reach land with the cable, and as we were in great depths to the west of our line of soundings, we should at once steer due east, to endeavour to recover the line of soundings and buoy the end of the cable in shallow water. I encouraged the exhausted men at the breaks, urging them not to give an inch more line than was necessary, that we might, if possible, reach shallow water. At length we came to the last mile, without a chance of reaching a shallow part. It now became necessary to prepare for eventualities, and it was decided we must endeavour to hold our position, in depths of 400 to 500 fathoms, for five or six days, while the Tartare went to Algiers for a barge or lighter, whereon to secure the end of the cable. We secured the cable along the side of the vessel with hempen fastenings, as a precaution against snapping, or being injured by friction, and restored the interior supports, removed from the vessel to allow the exit of the cable, as we were now left alone to the risk of rough weather. This, unfortunately, was not long in coming. Two vessels only passed us during the six days. The first was a Newcastle collier, which we hailed, and as the master seemed indisposed to come to us, our captain put off to him in a heavy sea, and enquiring his destination, offered to send a telegraphic message to his owners in England; to which the master replied by an incredulous grunt, remarking, “You haven’t got a railway terminus on board.” The other vessel gave us a friendly hail, enquiring our object in staying in such unfrequented waters, and the sight of a parasol on board cheered us with signs of civilisation. But to return to the cable. The storm continued, and on the third and fourth day the vessel plunged violently, causing great alarm for the safety of the cable; nevertheless, on the morrow, the fifth day we had hung on in hope, we received a telegraphic message from London via Paris, announcing the rapid progress of the additional length required, ordered by us through the telegraph four days previously. I was on the point of replying, when a sudden and violent plunge of the vessel caused me to exclaim, “It is gone;” and on trying the instrument, it proved there was no communication. We at once commenced hauling in the cable, and after some hours up came the end, broken, apparently by friction on the rocks at the bottom, about 502 fathoms in length from the vessel. I must now briefly say a few words upon the Atlantic telegraph, and the great depths of the ocean. This subject would alone occupy an evening. I shall therefore only allude to a few general points in connection with it. The great depths of the Atlantic have until within these very few years remained unknown. It has been stated that Sir John Ross sounded in the Pacific with a line of 10,000 fathoms, or about 11 miles, without touching bottom. Scientific men had also come to a conclusion that the greatest depths of the ocean did not exceed eight or nine miles, and the uncertainty as respects all former attempts at deep sea soundings, appears to have been very great, and in some cases it was supposed to be fathomless, eleven miles of wire having been cast out without touching bottom. At last it was proved that by a common twine thread, for a sounding line, and a cannon ball of 60 lbs. weight, for a sinker, attached, the line being allowed to run from the reel as fast as the ball would take it, (care being had to pay it out from a boat, which could be kept stationary to maintain the line as perpendicular as possible,) correct soundings could be obtained. 4 " 29 " 1800 to 1900 "
By this decreased ratio of descent it could be ascertained the moment the line touched the bottom, for when this took place the currents would sweep the line out, at a uniform rate, whereas the cannon ball, while it continued to descend, would drag it out at a decreasing rate. A contrivance was also made by which the ball would detach itself, quills being inserted at the end which passed through the hollow of the ball. Specimens of the bottom were thus brought up by the quills, on the ball striking the bottom, which proved to consist of the most minute microscopic shells. The greatest depths which have been reached by these means in the North Atlantic Ocean have been 25,000 feet. It was some two years since, when Mr. Faraday was explaining the subject of induction, that a fact was named to him of a current being obtained from a length of 300 miles of gutta-percha covered wire half an hour after contact with the battery. I remember speaking to him on the subject, and enquiring if he did not believe this difficulty was to be overcome, and I received from him every encouragement to hope it might; but it at once became necessary that this point should be cleared up, or it would be folly to pursue the subject of the union of America with this country by electricity. I at once earnestly urged on Mr. Whitehouse to take up this subject, and pursue it independently of every other experiment, and a successful result was at last arrived at on 1000 miles and upwards of a continuous line in the submarine wires in the several cables, when lying in the docks. It did not rest upon one but many thousand experiments; it was further proved on 2000 miles of subterranean wire in the presence of Professor Morse, while in this country, and beats from 230 to 270 per minute were recorded, or equal to twelve to fifteen words per minute. In the Atlantic cable the copper or conducting wire is composed of seven twisted wires formed into one, thus avoiding the danger of a flaw, which any single wire might be subject to; three separate coats of gutta-percha are then laid one over the other, the wire being thus perfectly insulated. This gutta-percha core passes and repasses in the course of its manufacture no less a length than 40,000 miles. The outer iron wires, of which there are 126 to each mile, are twisted into strands each containing seven wires, making an aggregate of 315,000 miles to the 2500 miles of cable. The construction of the cable is under the control of Messrs. Bright and Whitehouse.